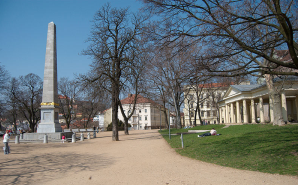 Denis Gardens is a park right in the middle of Brno. It’s situated around the Cathedral of St. Peter and Paul, on Petrov hill. Enjoy a peaceful walk through the park and the beautiful view from the top. Especially, but not only at night this is the place to be. If it’s too cold to go outside or you’re just plain lazy, you can virtually visit the park, at least. Located almost centrally, in the Královo Pole District, the Technical Museum offers a great lot of permanent exhibitions (for instance clockworks, historical vehicles but also electron microscopy or steam engines). Some of the exhibitions are located outside of Brno as well (the water- and windmill, old iron-mill or a blacksmiths). For more information about the exhibitions visit the museum’s official websites. I was very much impressed by the technical game-room where you can actually touch and watch how physics works. You can conduct pre-designed experiments on your own and watch the resulting actions. The experiments are changed from time to time, some are added, some disappear. Even though the exhibition is probably aimed at school children, it’s fun for adults as well (especially for us who are oriented toward humanities and not so great friends with technology). Worth visiting! 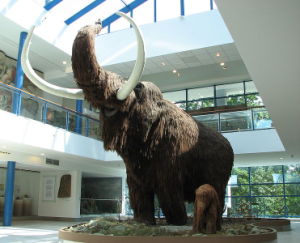 If you haven’t grown up in Brno, you missed out on a lot – the Sunday visits to the mammoth! Yes, there is a mammoth in Brno. It even has a baby mammoth. It’s a part of a permanent exhibition of Moravian Museum (Moravské Zemské Muzeum). The exhibitions walk you through the evolution of humankind and the oldest settlements in Europe and Moravia. I can almost hear your protest. But don’t worry, we’re not going shopping. We’re going to do some sports! From April till October, the Olympia park is open. The park offers not only a great and equipped playground for children (there’s also a labyrinth! ), but offers outdoor sporting activities, such as an climbing wall and an in-line skating circle from which you can skate alongside the Svratka river and end in the city center, near the Kajot Arena (better known as Hala Rondo). Most of the attractions are free, but you’ll have to pay for the railroad and the climbing wall. Even if you can’t stand shopping and like nature, I’m sure you’ll enjoy yourself here. Brno Circuit is better known as Masaryk Circuit. Be careful, the name can refer to one of two race tracks. The old one is nowadays used as a public road (if you hear people from Brno say “old highway”, or in Czech “stará dálnice”, that is it), the new one is used for many racing events. Best known and probably most visited is Grand Prix motorcycle racing. I only recently learned that there are guided tours around the Automotodrom Brno. See and feel the history of the circuit(s). If you’re a motorsport fan, this is definitely a must! See, it wasn’t that bad or dangerous after all, was it? ‹ 3rd Study Czech Friday – Who stole a cactus?